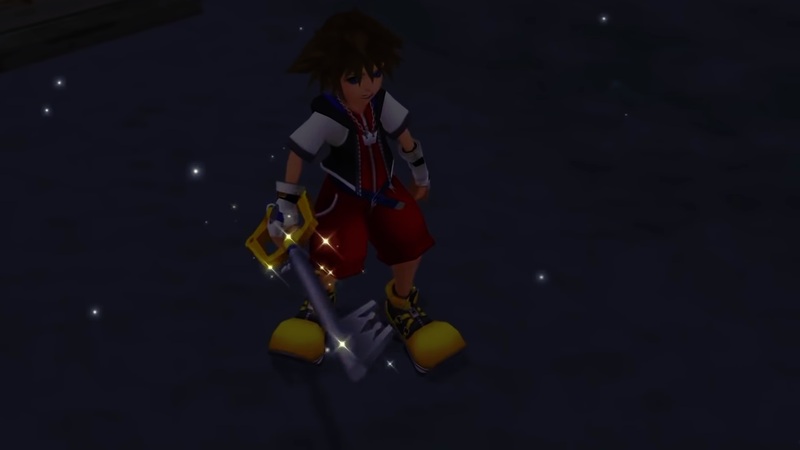 For this one, we're looking into what went down during KH1, Chain of Memories, and 358/2 Days! Welcome to PART 2 of our recap of the story of Kingdom Hearts! Here’s we try to give everyone a primer / refresher on what’s gone down in the game’s lore so you can catch up when you play Kingdom Heart 3 (WHICH IS OUT TODAY)! For this part, we’re covering the events of KINGDOM HEARTS 1, CHAIN OF MEMORIES, and 358/2 DAYS. All caught up? Then let’s get into it! 9 years later, Sora wakes up from a nap on Destiny Island. He and his friends Kairi and Riku are making preparations to set on a new adventure off the island. This whole plan gets derailed when Riku suddenly disappears into the darkness and the heartless wreak havoc. The kingdom key originally was given to Riku by Terra, but it actually choses a new master – Sora. This is how he obtains his first keyblade due to him being a stronger candidate. Now being armed, Sora fights through the heartless until he finds Kairi by the mysterious door in the underground cave. The door blows open and she disappears as well. The island is being engulfed in darkness and Sora is left thrown out to sea. Without his knowledge, Kairi’s heart finds safety within him. 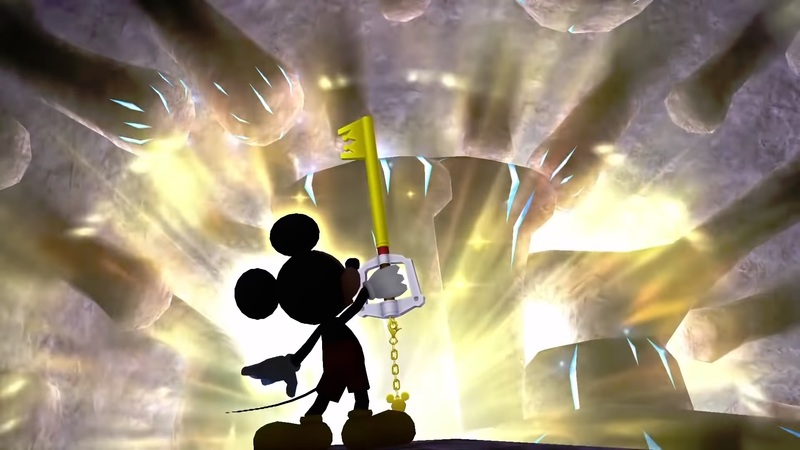 In another part of the galaxy, at Disney Castle, keyblade master King Mickey has left home to fight the heartless. Queen Minnie appoints Donald and Goofy to go find “the key”. Setting off on their journey, they find themselves in “Traverse Town”, a world where those who had lost their own seek refuge. It is here where Donald and Goofy meet Sora, a kid out looking for his friends. This world is no exception for the heartless, and Donald and Goofy realize that Sora’s weapon has the ability to seal holes from heartless. They all team up and go to different worlds. 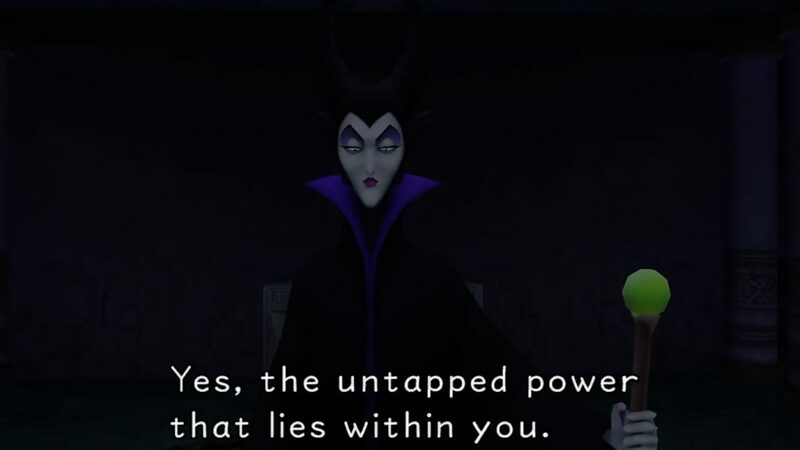 They eventually meet Maleficent who educates them on the seven princesses of heart, the Disney princesses we all know from the movies. They are all sleeping and protected by the seven shattered pieces of the X-Blade when it broke apart way back when. Maleficent needs them in order to unlock Ansem’s artificial kingdom hearts, so she recruits Riku in exchange for revealing Kairi’s location. When Riku finds her, she does not have her heart and is just in a coma. Later in the game, at Hollow Bastion, formally known as Radiant Garden, our heroes take on Riku. He is now possessed by Ansem and leads Sora to Kairi’s body informing him that her heart is located inside him. 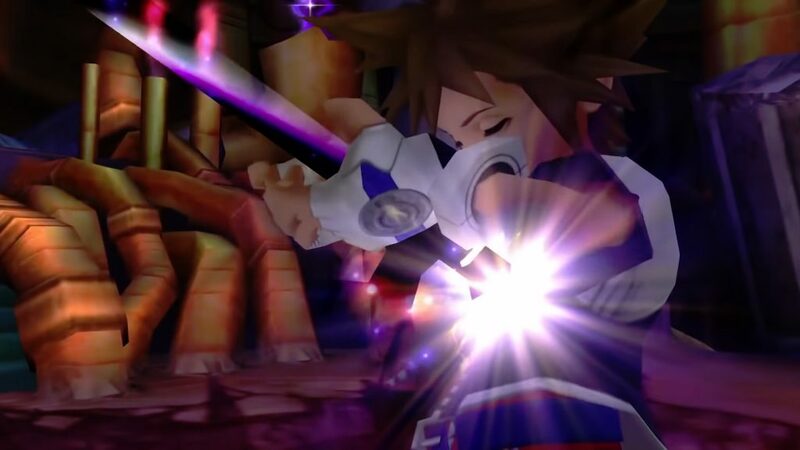 Without her heart in its rightful place, Sora can’t seal Hollow Bastion’s keyhole so he takes Riku’s blade and impales himself. Sora changes into a heartless but is changed back when Kairi uses her powers as a princess of heart to revive him back to his original state. After Ansem’s defeat, he tries to open his artificial kingdom hearts but is killed by the light inside it. Standing on the other side of the door is Riku and King Mickey with an army of heartless leaking out of the Realm of Darkness behind them. They try closing the door, which means closing the door on Riku and Mickey. Before it shuts, they promise Sora that they will meet again someday. 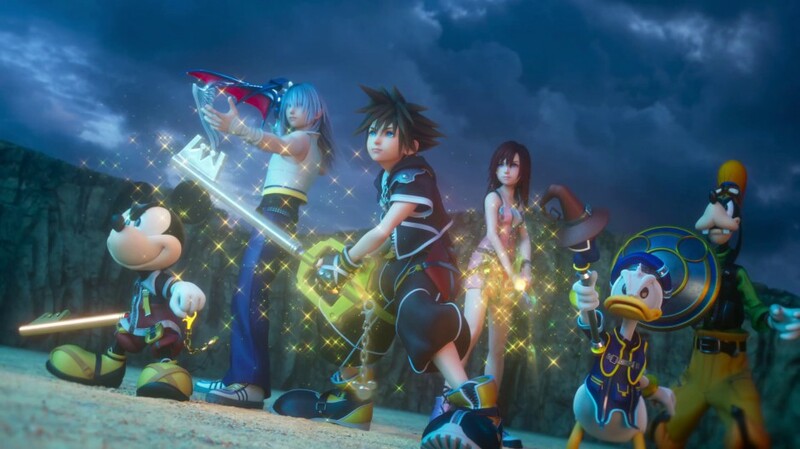 The worlds start coming back together, Kairi returns to Desinty Island, and Sora, Donald, and Goofy continue their quest, this time in search of King Mickey and Riku. The twist at the end is that without Sora’s knowledge, he unleashed his and Kairi’s heart and created nobody copies of them. 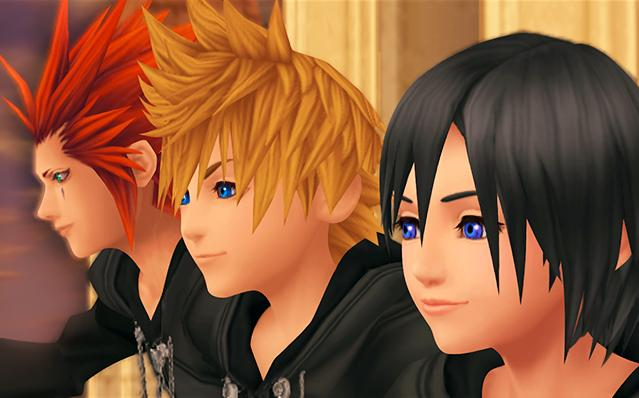 quick friends with Axel as they are tasked by the organization with fighting heartless together, but the Organization’s true intention is to use their hearts to create another artificial door to kingdom hearts. Not long after, another member joins the organization by the name of Xion. She is able to change her appearance based on her relationship to other people as well as also being able to handle a keyblade. The organization is currently preparing for the arrival of Sora, and as our heroes make it into the castle they lose their memories. 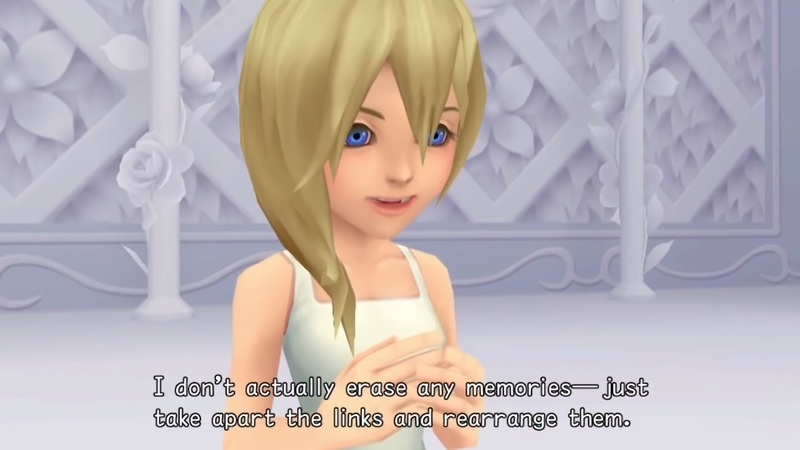 Still being held captive, Namine is able to manipulate their memories to whatever she draws in her sketchbook under the influence of the organization. Two organization members plan to use Namine to make Sora overthrow the organization from the inside. Sora, Donald, and Goofy work their way through the castle, defeating various members of the organization until they free Namine. Now that she is not under their influence, she attempts to regain their memories by bringing them to the memory pods. Riku shows up refusing to let go of the darkness within his heart, so he tasks Namine to take care of Sora while he is unconscious. Because of Sora’s current state, it causes Roxas to fall into a coma as well for several weeks. Diz is also invading the castle and makes his way to the memory pods. In order to save Sora, he tells Namine that they are taking Sora to the mansion in Twilight Town in order to speed up the memory recovery there. Roxas wakes up and he is briefed on what happened while he was asleep, including Sora’s disappearance, and Diz’s invasion of the castle which took the lives of some of the organization members in the process. 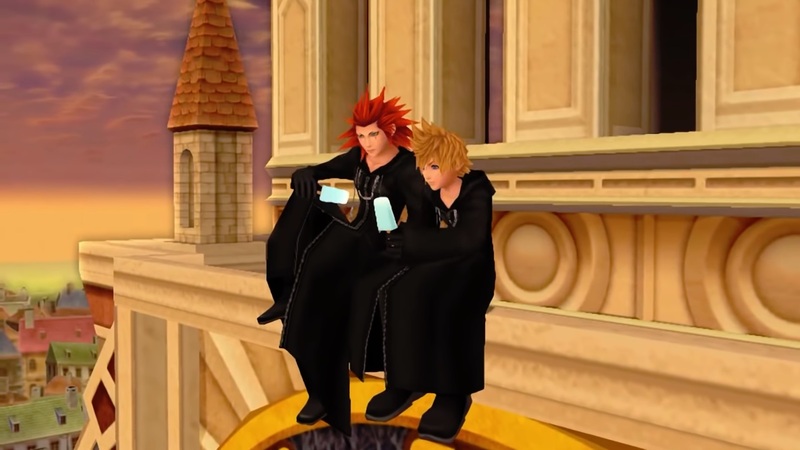 Roxas starts to bond more with Axel and Xion as they eat ice cream and sit on the clock tower in Twilight Town together. Complications arise when Sora’s memories start to be regained as they are starting to mess with Roxas’ head and he seems to be having a bit of an identity crisis. This makes him question the role he plays within the organization and its very existence as well. Roxas is not the only one gaining Sora’s memories, Xion is, too. She meets with Riku on Destiny Island who is adamant that she go with him to find Sora and give his memories back to him. Things get even more complicated when it is found out that Xemnas was behind this memory mishap in an attempt to stop Namine’s progression. Roxas seems to be getting weaker, as Xion’s recollection of Sora’s memories are getting stronger. Xion goes back to the organization, but again Riku is still persistent that she go with him and she finally agrees. Axel manages to find out Xion’s true identity as well as Xemnas’ plan, but Roxas is upset when Axel wont tell him what his own identity is. This prompts Roxas to leave the organization despite Axel’s warnings that he will be killed for doing so. In Twilight Town, Xion and Namine meet. This meeting is quite important because this is where Namine tells her that if she decides to merge with Sora to return his memories, she will be erased from the memories of anyone who has ever met her – including Roxas’ and Axel’s. Before she can agree, Axel finds her and brings her back to the organization. Xemnas reprograms Xion, and Roxas meets her in Twilight Town once again – this time she looks identical to Sora. This is a forewarning of her decision before she challenges him to a fight where she tricks him into killing her. As she disappears, Sora’s memories are being regained, and she is being erased. Roxas’ last memory of her is an instruction: to prevent Xemnas from reopening kingdom hearts. The final battle consists of Roxas fighting Riku who has turned into heartless Ansem. In an attempt to save Roxas, Diz digitizes him, whips his memories and sends him on a summer vacation to Twilight Town. Nintendo Just Announced Metroid Prime 4!